It's easy to start writing code with Python: that's why the language is so immensely popular. However, Python has unique strengths, charms, and expressivity that can be hard to grasp at first -- as well as hidden pitfalls that can easily trip you up if you aren't aware of them. 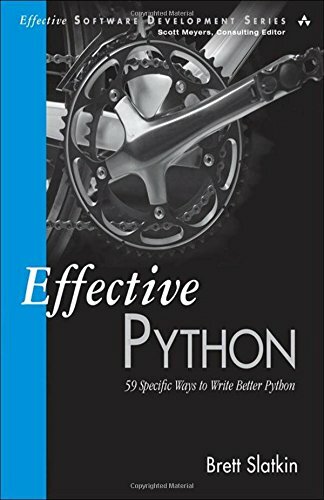 Effective Python will help you harness the full power of Python to write exceptionally robust, efficient, maintainable, and well-performing code. Utilizing the concise, scenario-driven style pioneered in Scott Meyers's best-selling Effective C++, Brett Slatkin brings together 59 Python best practices, tips, shortcuts, and realistic code examples from expert programmers. Through realistic examples, Slatkin uncovers little-known Python quirks, intricacies, and idioms that powerfully impact code behavior and performance. You'll learn how to choose the most efficient and effective way to accomplish key tasks when multiple options exist, and how to write code that's easier to understand, maintain, and improve. Each section contains specific, actionable guidelines organized into items, each with carefully worded advice supported by detailed technical arguments and illuminating examples. Using Effective Python, you can systematically improve all the Python code you write: not by blindly following rules or mimicking incomprehensible idioms, but by gaining a deep understanding of the technical reasons why they make sense.